Given the success of the Angry Birds game, it’s no surprise an animated feature film is schedule for July 2106. Or, that Hasbro, a branded play company, would see the virtue in an alliance. Rovio Entertainment and Hasbro are partnering for Angry Birds Transformers, a mobile game that will also spawn a consumer goods and product line on Hasbro’s Teleponds platform. The Telepods tech lets fan teleport their favorite Angry Birds Transformers characters into the game. To ensure what John Frascotti, CMO at Hasbro, calls a “completely immersive branded experience,” the kids toy/TV company has joined with Rovio to let fans experience Autobirds and Deceptihogs across various formats and platforms. 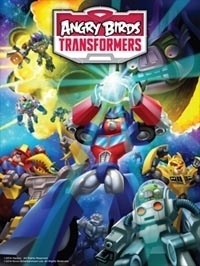 Transformers has been a successful brand since the 1980s; Angry Birds is much newer. The rather quirky game debuted in 2009 and the company says it is the most downloaded game of all time. Blanca Juti, CMO for Rovio, says “the mash-up” will appeal to fans old and new. Earlier, Hasbro and Rovio collaborated on Angry Birds Star Wars and Angry Birds GO! Product lines. In September, Angry Brids Stella: Teleponds will be available. No word on Angry Birds Transformers' release date, but many expect it to follow Stella. CNET reported Hasbro plans an accompanying animation and a line of Telepods, plastic figures that pop into the app when placed over the camera of a tablet or smartphone. Hasbro’s other properties include Monopoly, Play-Doh, My Little Pony and Littlest Pet Shop.